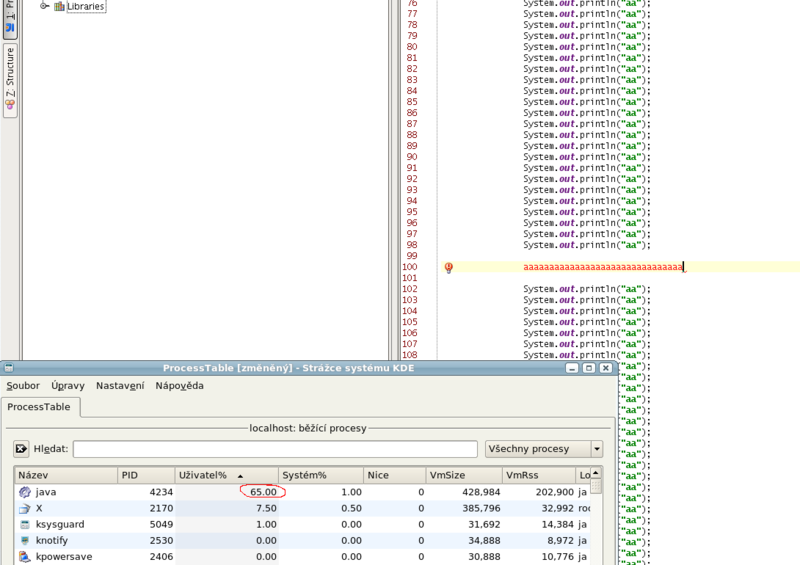 whenever I start writing in editor (Java, JSP...) IDEA uses almost 50% of CPU and everything gets slow. Can be JDK6 the problem? Or 6.0.5? of CPU and everything gets slow. FATAL ERROR: JVMPI, an experimental interface, is no longer supported. Please use the supported interface: the JVM Tool Interface (JVM TI). I've added -Xrunyjpagent:port=10100 to IDEA_HOME/bin/idea.vmoptions. I hope it uploaded correctly (ftp://ftp.intellij.net/.uploads). Do you have two screens and use X in Xinerama mode? I experienced a similar problem using that constellation, while using only one screen (that is no Xinerama) showed no performance problem at all. work with plain Java files? Yes, two screens (laptop and external LCD). But I don't know whether xinerama is installed by default in Fedora, I didn't install it. Problems appear also while editting CSS and plain Java files - the CPU usage isn't so huge, probably because these files are much smaller. The interesting thing is, that I don't need to edit this JSP file - switching to the table with this file is enough for CPU usage to grow. I made another snapshot where I edit different kinds of files and I switch between JSP and non-JSP files. It's true that I use two screens but the problem remained even when I unplugged external screen from my laptop. And JDK 5 didn't change anything. I created new project and no problem. But problem still remains when I edit the old project. This old project was created in IDEA 6.0.4 and after machine reinstall and IDEA upgrade it makes these problems. While working in IDEA, open a console and run 'top'. In my case there was always the X.org process consuming the CPU (approx. around 40% while typing around in IDEA). What worked for me was to disable xinerama and use the Nvidia Twinview facility (I have a nvidia graphics card), which has a much lower CPU and memory footprint. I'm sorry for little mystification, the problem isn't dependent on project. And an interesting observation: the CPU usage grows faster when I type slowly (a..pause..a..pause..a). I guess it has nothing to do with two screens and X (see screenshot). I will second that, I've been suffering for a long time on a 3 screen xinerama setup. Strangely intellij's performace can vary greatly from being fine to totally unusable, i've never been able to figure out why, though the choice of theme can greatly affect it. So, is it a problem of my hw,sw configuration or anything is bad with IDE?